Prithu Singh Thakuri is the CEO and team lead at WPALL Club. She loves content writing, creating promotion plans, SEO plans, and make strategies to put her company at the top of WordPress content business. Prithu Singh Thakuri at WordCamp Biratnagar 2018. She was one of the panelists in the panel discussion at WCBRT2018. The panel discussion was on the topic “Girls in WordPress – Story, Experience, Opportunity, and Career”. We interviewed her in order to know more about this inspiring person. Here’s everything that went down during the interview. I am an IT student and a WordPress enthusiast who loves working on WordPress, surfs about different things happening with WordPress and writes about it. Currently, I am working as the CEO and team lead at WPAll Club – A Complete WordPress Resource Site. I am based in Kathmandu which holds a number of WordPress specialized companies and a very active WordPress Community. WordPress Kathmandu Community runs regular meetups, WordCamps, and other such events to introduce and flourish WordPress among beginners and grow the community bigger and better. I started my journey with WordPress a few years back when I joined Access Keys as the content writer. There I used to write WordPress blogs for different sites. In 2016, we started WordPress content marketing business – WPAll Club and since then, I am leading the company. In the beginning, I was very much new to technical stuff and especially, WordPress. To understand all those stuff and write about them was quite hard. On top of it, the business competition was always there. So, to make myself ready for it, I used to spend lots of time learning, researching, and experimenting. I used to go through different resources available, follow the professionals’ tips and ideas, and consult much with the experienced people around me. Of course! I first visited Biratnagar in early 2018 for a WordPress meetup where I was overwhelmed seeing those passionate and energetic audiences. So, I was very excited to see them again. At WordCamp Biratnagar, I was one of the panelists for the discussion on “Girls in IT – Story, Experiences, and Career”. Our talk was about career opportunities on WordPress, especially for girls where we shared our experiences and stories. From our talk, what I hope is the interest which has brought that audience to attend WordCamp further be developed into a determination to pave their successful career. The way WordPress community in Nepal is dedicated to grow the community, help beginners, trying to contribute the best from their end, is awesome. Many new communities are being formed, many tech enthusiasts have found WordPress as their career option, working brilliantly good on it and achieving. For every WordPress passionate like me, the WordPress community has proven to be a great help. Networking with many new people, meeting all the community members together, learning and sharing different ideas, and feeling pleasure to be a part of this wonderful community is what fascinates me about WordCamps. 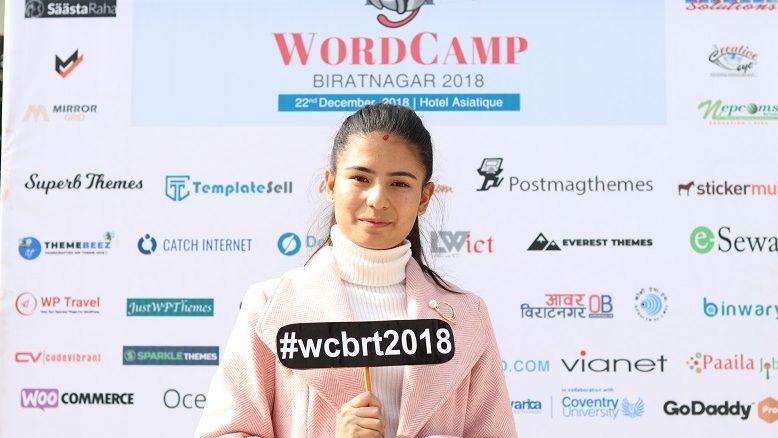 WordCamp Biratnagar 2018 was a bit different from the other WordCamps in terms of the nature of attendees. In other WordCamps, mostly attendees used to be the one who uses or works on WordPress. But in Biratnagar, most of the attendees were IT students who were only learning WordPress. It was exciting to see those energetic people with so much enthusiasm to know about WordPress and how they can get into it. I have been participating in a different community organized events such as meetups and WordCamps in different roles. In WordCamp Kathmandu 2017, I was a speaker and in WordCamp Kathmandu 2018 Contributor Day, I was leading the documentation team. Recently, I spoke at WordCamp Biratnagar and before that, I was also a speaker at one of the WordPress Meetups at Biratnagar. This is how I am getting involved in the WordPress community and looking for other ways to contribute more. WordPress community is a great help for the newbies. If you’re struck with any problem, don’t hesitate to ask. Most of the people in the community are helpful and supportive. And giving back to the community from your end is very important. Therefore, I advise new WordPress users to contribute to the community from whatever they can. Female participation in WordPress is comparatively low but is gradually growing. So, I am hopeful that it will keep on growing and we will get to see amazing involvement of many other females in WordPress in days to come. For WordPress resource, I follow different popular blogs and forums. Some of them are WPBeginner, Backlinko, Codeinwp, Neil Patel, and so on. Besides WordPressing, I love travelling, hanging out with friends, watching movies, and surfing different things on the internet. As a content publisher, I found it interesting to work with the new and advanced editor. Gutenberg editor is easier to use for beginners. So, I am enjoying working with it. Prithu Singh Thakuri undoubtedly is an inspiring and influential person in this wonderful WordPress platform. We want to thank her for taking out time for this interview. Do you want to know more about Prithu Singh Thakuri? Find him on Facebook or Twitter. Next → Next post: Interested in Content Writing? We are Hiring Content Writers!